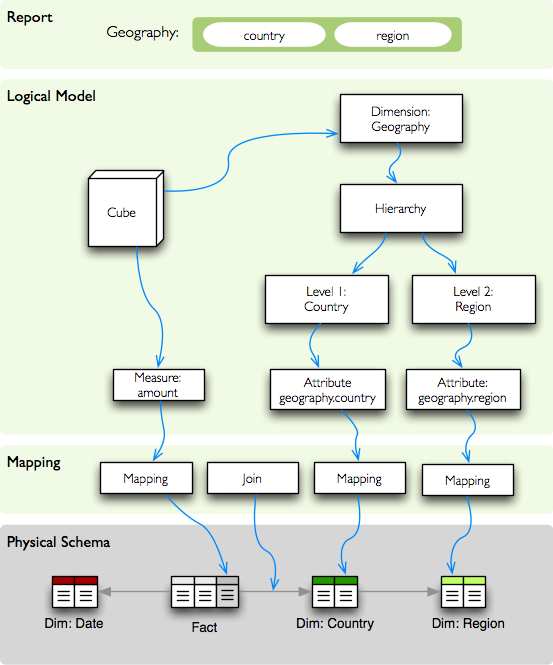 Repository of basic cubes models. Visibility: The joins and mappings are local to a single model. They are not shared within the workspace. Cube descriptions are stored as a dictionary for key cubes in the model description dictionary or in json files with prefix cube_ like cube_contracts. name * Cube name, unique identifier. Required. dimensions * List of dimension names or dimension links (recommended, but might be empty for dimension-less cubes). Recommended. measures List of cube measures (recommended, but might be empty for measure-less, record count only cubes). Recommended. aggregates List of aggregated measures. Required, if no measures are specified. key Fact key field or column name. If not specified, backends might either refuse to generate facts or might use some default column name such as id. fact Fact table, collection or source name – interpreted by the backend. The fact table does not have to be specified, as most of the backends will derive the name from the cube’s name. 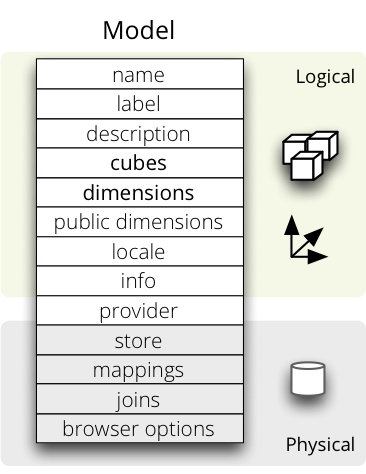 store Name of a datastore where the cube is stored. Use this only when default store assignment is different from your requirements. 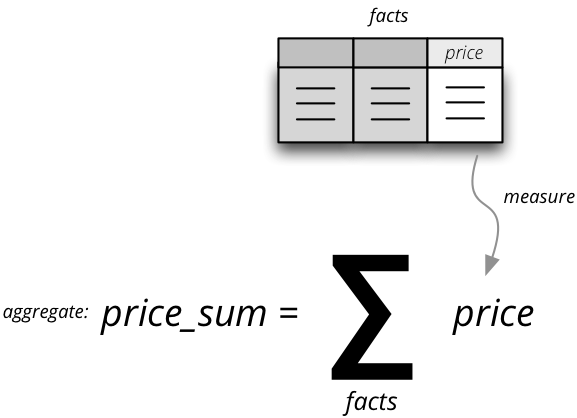 The key might be required by some backends, such as SQL, to be able to generate detailed facts or to get a single fact. Please refer to the backend’s documentation for more information. window_size – number of elements within a window for window functions such as moving average. If not provided and function requires it then 1 (one element) is assumed. exclude_hierarchies – hierarchies to be excluded when cloning the original dimension. Use this instead of hierarchies if you would like to preserve most of the hierarchies and remove just a few. The above cube will have three dimensions: date , customer and contract_date . 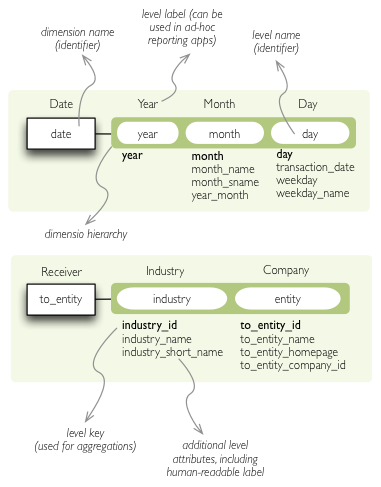 The date dimension will have only two hierarchies with lowest granularity of month , the customer dimension will be assigned as-is and the contract_date dimension will be the same as the original date dimension. info custom info, such as formatting. Passed to the front-end. If no levels are specified, then one default level will be created. If no hierarchy is specified, then the default hierarchy will contain all levels of the dimension. If no attributes are specified then only one attribute is assumed with the same name as the level. If no key is specified, then first attribute is assumed. If no label_attribute is specified, then second attribute is assumed if level has more than one attribute, otherwise the first attribute is used. Level attribute names have to be unique within a dimension that owns the level. Required is only name . Some dimensions and levels might have special, but well known, roles. One example of a role is time . There might be more recognized roles in the future, for example geography . Front-ends that respect roles might provide different user interface elements, such as date and time pickers for selecting values of a date/time dimension. For the date picker to work, the front-end has to know, which dimension represents date and which levels of the dimension represent calendar units such as year, month or day. The role of a dimension has to be explicitly stated. Front-ends are not required to assume a dimension named date is really a full date dimension. The level roles do not have to be mentioned explicitly, if the level name can be recognized to match a particuliar role. For example, in a dimension with role time level with name year will have automatically role year . Level roles have to be specified when level names are in different language or for any reason don’t match english calendar unit names. Currently there is only one recognized dimension role: time. Recognized level roles with their default assignment by level name are: year, quarter, month, day, hour, minute, second, week, weeknum, dow, isoyear, isoweek, isoweekday. The key value of level with role week is expected to have format YYYY-MM-DD.